This is a guideline on how to change the VNX Storage Processor IP and Name via Navicli. 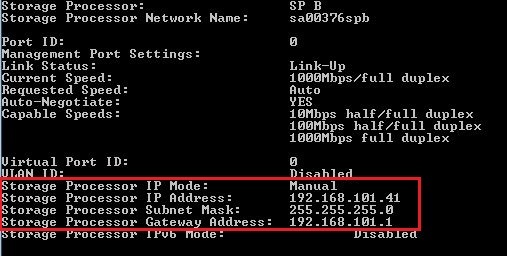 Navicli does not require a reboot of the SP after changing the SP IP address but does require a restart of the Management Server. Please note that a change of SP Name will require a reboot of the SP. Note: if you are using the Setup Page (http:// SP_IP /setup/) to change either the SP IP or Name then a reboot of the SP will be required. 1. If the array to be changed is part of a storage domain, you must remove it from the domain before proceeding. If the array to be changed is the domain master, assign another array to that role before continuing. This can be done via Unisphere VNX Client. 3. Check that all hosts have dual-Fibre connectivity and that failover software is working correctly. Running this command on one SP is sufficient as it will sync the changes automatically with it’s peer SP. Please refer to the VNX Procedure Generator for a detailed list of specific guidelines for completing this task. I have to tell you this: I have gotten out of more pickles because of your articles than anyone else on this subject. I barely ever post anything on the internet, but I felt I had to leave you props and let you know how many of us you help. Thank you for your time, this article really help me to configure VNX5400 lab. Can same be deployed on VNX 5800? I have a query, Can i remove my Control stations and Data Movers to use the VNX Unified as just VNX Block ? There is no data on the array, can you please list the steps to re-configure the array? Hi Ravi, thanks for the feedback. Sorry I do not have this procedure, I would advise you to contact support.